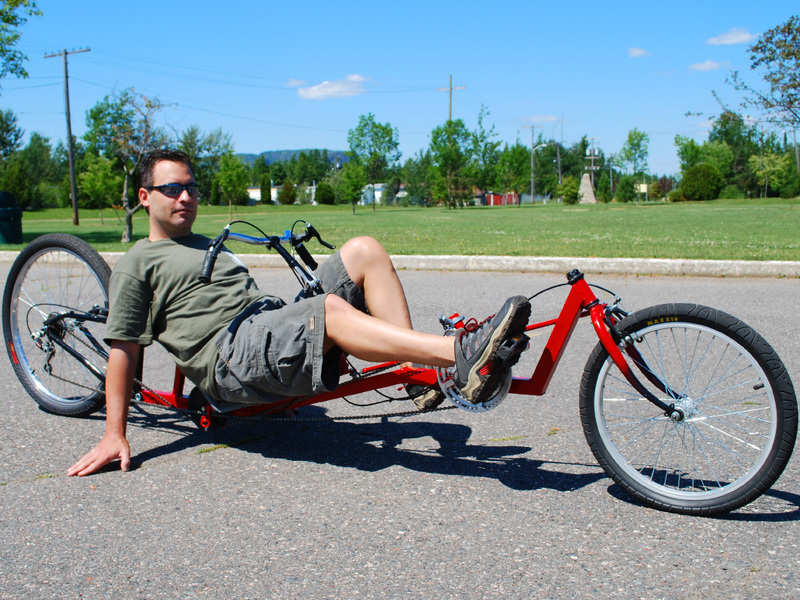 Build Your Own Ultra Low Recumbent LowRacer. The Marauder long wheelbase recumbent lowracer puts you in the pilot’s seat of an extremely laid back and low urban racing machine! This DIY lowracer is all about the speed, and with a suspended 26 inch rear end and linked steering, it will handle as well on the road as it does on the velo track. The long wheelbase means that there will be no chain or crank interference with the front wheel, so you can enjoy city riding with agile and responsive steering. 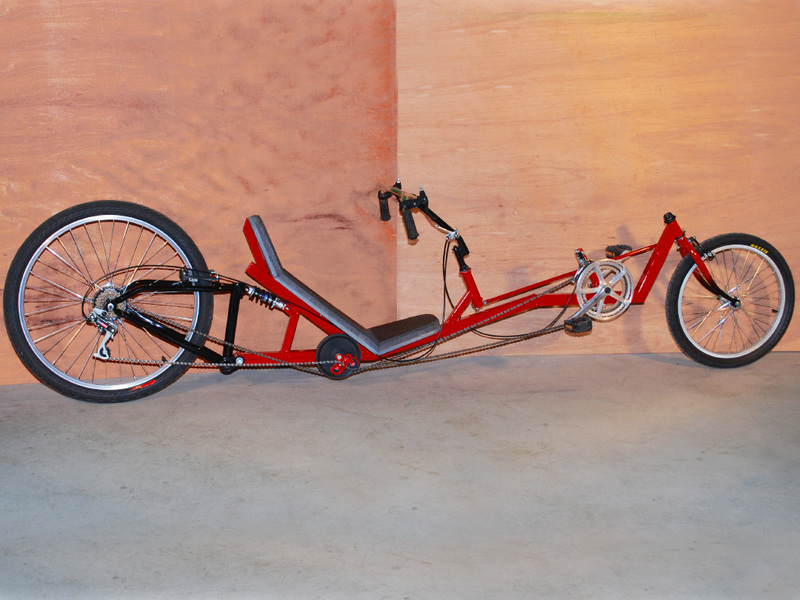 Every part of this DIY lowracer can be taken from a standard bicycle, or purchase from a hardware store, and the frame is made of common square steel tubing. 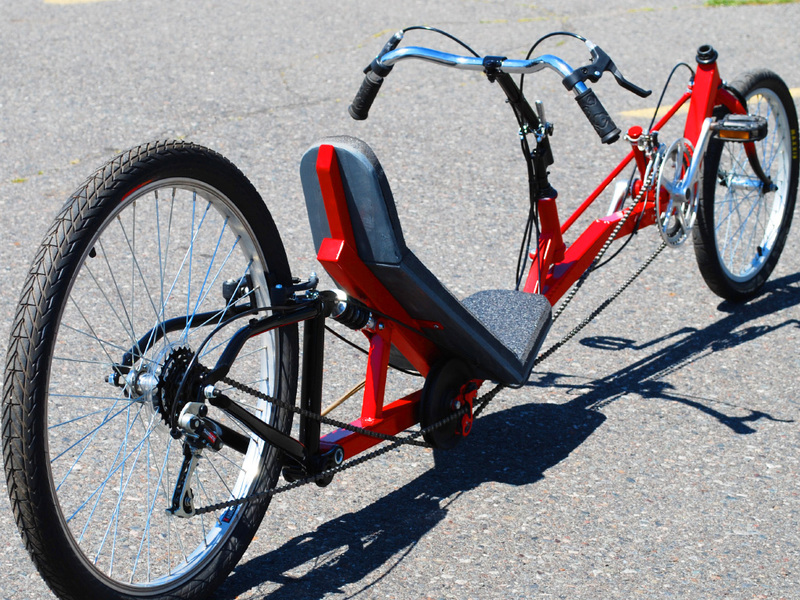 This diy recumbent bike plan is a good choice for those just getting into the bike building hobby. This LowRacer is Fast, and Easy to Ride. With the laid back recumbent seating position and minimal frontal area, you can deliver your full force directly into the cranks and cheat the wind to gain that unfair advantage over your upright cycle riding friends. The 26 inch rear wheel allows for maximal high gearing so you can push your limits on the flats and reach all time personal speed records down those long hills. 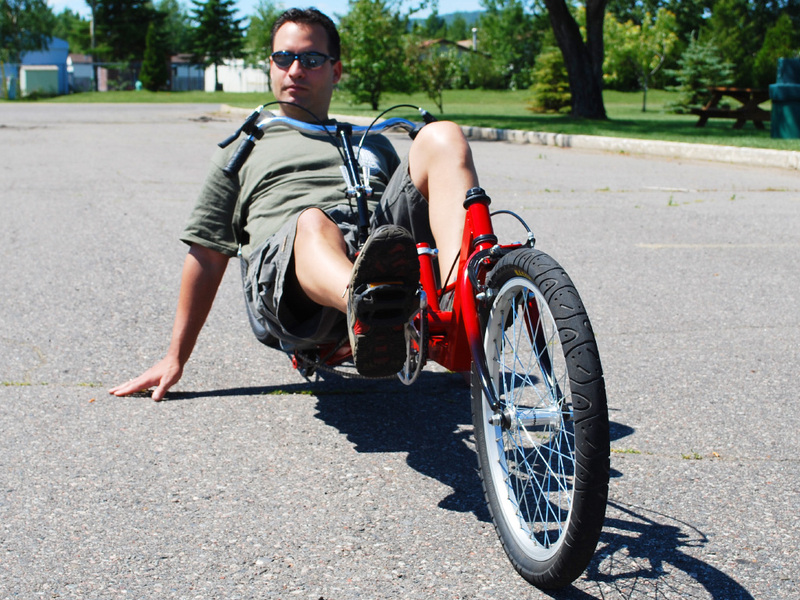 With a full range of 26 or more speeds, hill climbing is also well within reach of this DIY recumbent lowracer. The linked steering system is easy to make using hardware store ball joints and some small diameter tubing. The rest of the steering compontnets are just taken from an ordinary bicycle or purchased at your bike shop. Rear Suspension for a Super Smooth Ride. With rear suspension, you can push the limits out on the city streets, and not worry about the bumps and potholes. All of the suspension parts can be taken from a single mountain bike frame, or purchased from a bike shop. The Marauder handles well enough for single handed riding, and only takes a few days to get used to. Being so low and laid back is a new cycling experience that is more like piloting a two wheeled jet fighter than a bicycle. The Marauder has an appetite for speed that will work your legs muscles in ways that an upright cycle could not. 36 or More Speeds for Racing or Hill Climbing. Because the entire transmission is built using standard bike parts, you can add as many speeds as you like to your lowracer. The cranks are also adjustable at any time using only a wrech to position them anywhere on the frame to support riders of any height. For extreme high speed riding, you can adapt a custom front chain-ring to add a much higher gear. Marauder makes a great base for a faired velomobile. You can easily build a seat from wood and foam as shown in the plan, or install a factory recumbent seat on the frame. All of our DIY bike plans leave plenty of room for builder modifications, so you can build a cool DIY low racer suited to your style. Add a Full Fairing and Break The Speed Limit. 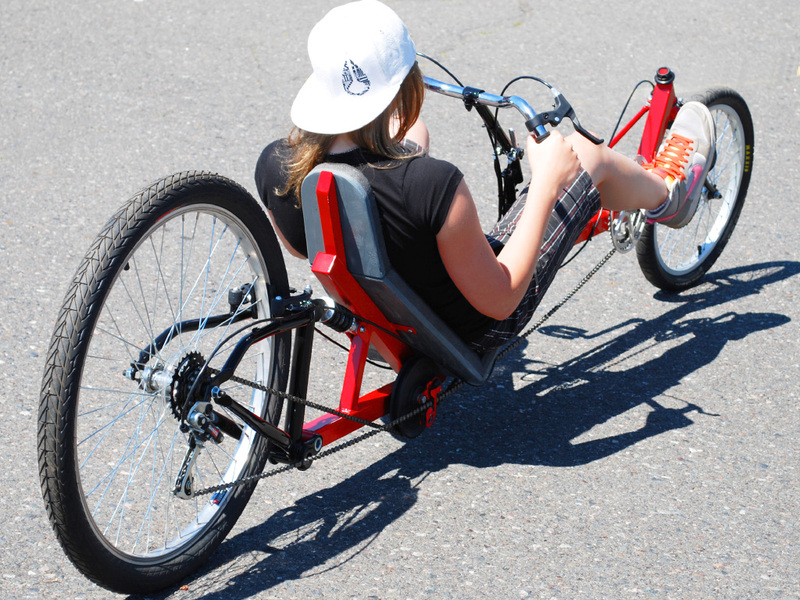 With a streamlined aerodynamic full body, this type of recumbent bike is capable of highway speeds! Really, check google for human powered speed records. The Marauder DIY Lowracer is a perfect base to experiment with aerodynamic fairings, pushing the limits of what is considered possible on human power lone. Being a long wheelbase lowracer, the cranks are behind the wheel for a more "tame" ride out on the city streets. Marauder also makes a good city commuter. The easy to build sliding bottom bracket allows riders to adjust the cranks to their leg lengths by simply tightening two bolts. The rear suspension system is also easy to build as it takes most of a rear triangle directly from a salvaged mountain bike. They call these bike lowracers for a reason! Being so low to the ground minimizes your frontal area, resulting in a much more aerodynamic vehicle. Cheating the wind is easy when your frontal area is half the size of that of an upright bike. Your riding buddies will work much harder to keep up with your lowracer! When you sit in the pilot's seat, its difficult not to feel the need for speed. Riding the Marauder is like riding a jet fighter, and your legs are the afterburners. 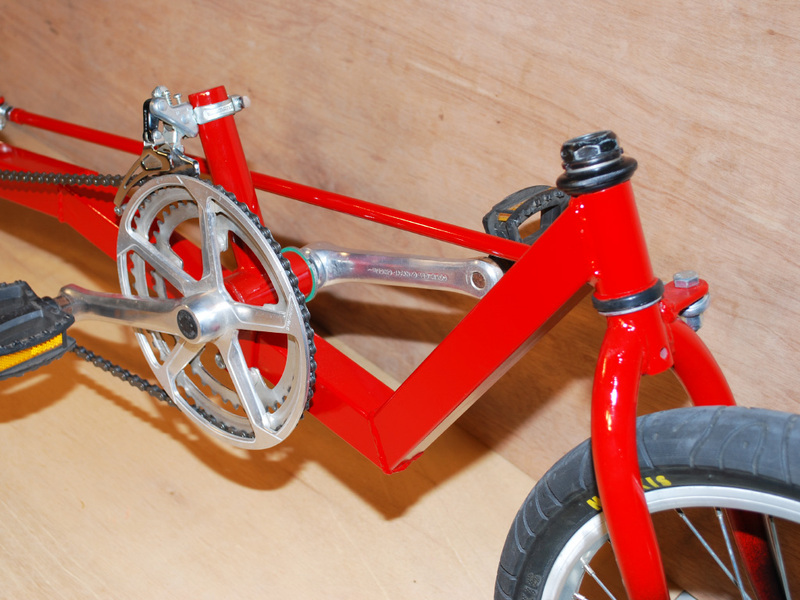 Learn how to modify standard bike parts into something new using only basic hand tools. Our plans are all about recycling junk parts into new parts, so you won't have to spend a bundle to make your own amazing lowracer. Build this for the cost of an SUV tank of gas! 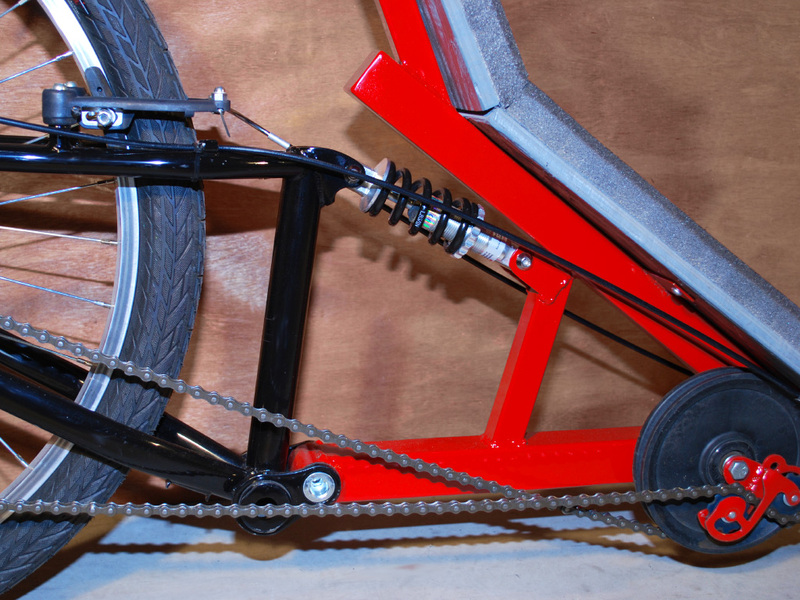 Exersizing is Extreme Fun on Your DIY LowRacer. Recumbent bikes work muscles in a very thorough way, and your gains translate into speed gains out on the bike trail. 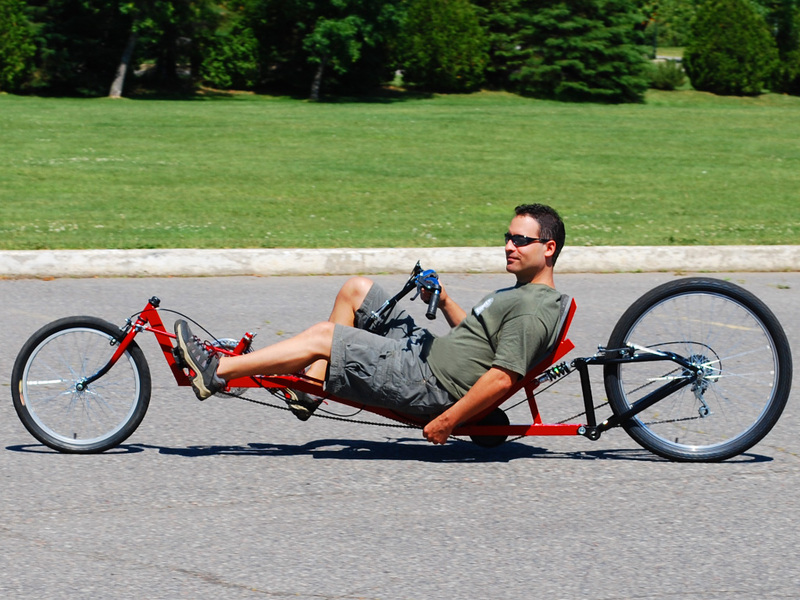 Once your recumbent legs are tuned up, your upright buddies will have no chance of pacing you, unless they also start building their own DIY LowRacers! The marauder is also a great bike for long touring and commuting, as you sit in a natural position with all levers and shifters placed within reach on the handlebars. No more killer bike seats! The frame is built on cut at a time, with detailed text and photos explaining how and why things are done. You always have the opportunity to stray from the plan as well, changing just about any part of the design to suit your needs. Build Your Own Unfair Speed Advantage! With some effort, you too can build your own lowracer for less than the cost of a good quality road bike wheel, and there is no need to feel guilty about your speed advantage. When you build your own DIY racing recumbent, it is taylored to you, and that will always be an advantage. There is a reason why all of the human power speed records are owned by DIY recumbent lowracers. With the ability to push much harder, and gain that areodynamic advantage, you are only limited by your abilities, not the machine. What is your speed limit?